A lot of amateur golfers will tell you it’s much easier to play off grass than a synthetic surface. 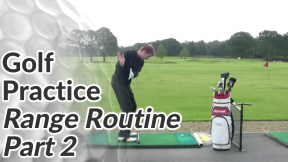 However, you’ll get away with a lot of poor strikes from a mat that would be disastrous on the golf course (which is one reason I believe a lot of golfers struggle to transfer their range game to the course). 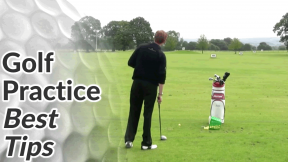 The best practice surface is grass, so if you have a grass range available to you, use it. 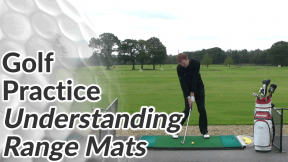 Range mats can encourage you to ‘clip’ the ball off the surface but taking a divot is an important part of solid, crisp ball-striking. 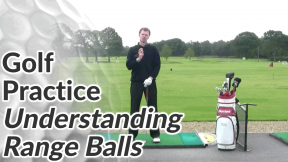 The shape and direction of your divots can also give you good feedback about your swing. If you hit slightly behind the ball (called heavy or fat shots) on a range mat, the club will bounce off the mat and still make a reasonable contact with the ball. On grass, the same swing would send the ball just a few yards down the fairway. Listen for the sound of the strike and discount heavy strikes as bad shots that you’d be punished for on the course. Don’t fall into the habit of ‘clipping’ the ball off the surface of the mat. 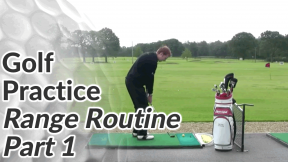 For a good strike the club should be bottoming out and brushing the synthetic turf after the ball.